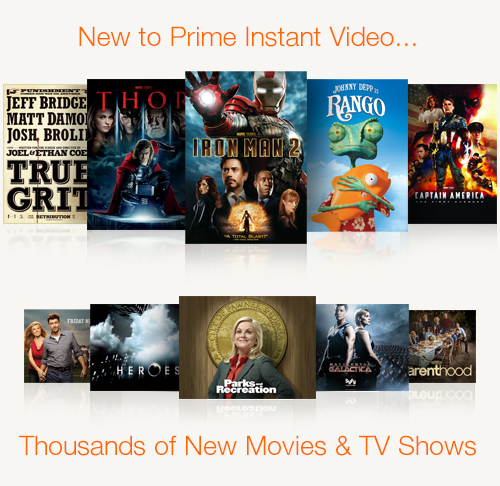 Great news for Amazon Prime - more high quality movies and TV shows with unlimited instant streaming. Movies from Paramount Pictures, MGM, and Lionsgate. Enjoy Thor, Iron Man 2, and Captain America: The First Avenger. Recent hits such as Transformers: Dark of the Moon, Warrior, Super 8, True Grit, and Rango. 2,000 movies will be coming to Prime Instant Video this year. Plus, popular TV shows from NBC Universal, including past seasons of current hits Parks and Recreation and Parenthood, plus all seasons of Heroes, Battlestar Galactica, and Friday Night Lights. Prime Instant Video now has over 25,000 movies and TV episodes to choose from! You can watch on Kindle Fire, game consoles like PlayStation 3 and Xbox 360, and on hundreds of TVs and Blu-ray players! -Over 180,000 Kindle books to read for FREE from the Kindle Owners' Lending Library. If you're not already a member, sign up for a one-month FREE TRIAL today!